The M60 Comes with many features as standard. As the M60 is constantly evolving there are many features that have been developed as Bolt on Features. Most upgrades can be carried out though a simple software swap. 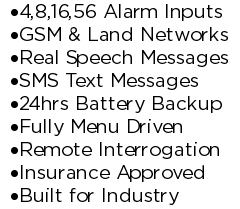 Every M60 Alarm Autodialer is tailored to our customers needs, If there is something specific that you wish the M60 to do for you then please ask. If the feature has not already been developed then we would be happy to develop it for you. Allows the user to change the phone and or pager numbers that the M60 will call in the event of an alarm detection. This is standard on some versions of the M60. Allows you easily view past alarm events, outgoing calls & alarm cancellations on the LCD display. Ideal if you need to check who is cancelling alarms or whether you had a alarm. The M60 can be programmed to automatically dial out at a pre-set time and date to test for system integrity. E.g. every 3rd Tuesday of the month at 16:00 a test call will be made. A Duty Roster is the list of telephone numbers that the M60 will phone to communicate an alarm. Automatic Duty Roster switching - e.g. the M60 will switch to the day Roster at 8:00, the night Roster at 18:00 and the weekend Roster at 18:00 on Friday. Automatic Isolation - The M60 can automatically isolate itself during certain periods. e.g. 08:00 to 18:00 on weekdays when people are on site. ‘0’ Key Cancelation - allows the user to press the “0” key on their phone keypad during an alarm call to cancel the M60. Allows each input channel to be linked to a DIFFERENT set of telephone numbers. Instead of having 16 normal alarm dialers have 1 M60 Ultimate. Each Input Channel can have its own alarm delay. e.g. Channel 1 (Fire) - 0 Seconds, Channel 5 (Power fail) - 60 Seconds.. The Optional GSM Dialer Module can be used to connect the M60 to the GSM network either as a direct replacement for a fixed land line or as a backup incase the land line fails or is cut. See Analogues and Data Logging for more information. The M60 can be powered by Solar or Wind power if located remotely. Allows the Switching of up to 16 remote pieces of equipment via a telephone or computer. The M60 can now be upgraded to allow SMS alarm text messages to be sent instead of or as well as real speech messages. This upgrade can be sent with a new machine or retro fitted to a machine currently installed. The "Multi Channel Active" allows the user to receive a much shorter alarm message. If more than 4 (alterable) channels / inputs are active the M60 will play a short user recordable message e.g. "Multiple Channels are Active - Report to Site Immediately". The M60 Lone Worker system offers a fool proof method to protect your staff with out needing to provide remote radio equipment. For more information on how our system works please visit our Lone worker section here, or contact us. If the M60 is still in alarm X minutes after it has been Cancelled, it will start dialling out again. E.g. if someone cancels the M60 then rolls over and goes back to sleep.